Harvey Milk’s dream for a better tomorrow filled with the hope for equality and a world without hate guides the Foundation. Harvey Milk’s ground breaking election in 1977 as one of the world’s first openly gay elected officials-and its most visible one- symbolized the freedom to live life with authenticity to millions of LGBT women and men around the world. Harvey served less than a year in public office before his brutal assassination but his life profoundly changed a city, state, nation and a global community. His courage, passion and sense of justice rocked a country and stirred the very core of a put down and pushed out community, bringing forward new hope and a new vision of freedom. As a not- for-profit global organization, our program goals – to empower local, regional, national and global organizations so that they may fully realize the power of Harvey Milk’s story, style, and collaborative relationship building – are as large and bold as Harvey taught us! The Foundation, through Harvey’s dream for a just tomorrow, envisions governments that celebrate the rich and universally empowering diversity of humanity, where all individuals – gay, lesbian, bisexual, transgendered, racial and ethnic minorities, the elderly, the young, the disabled – all who had been excluded can fully participate in all societal rights without exception. Harvey’s inspiring life has been the subject and inspiration for Academy award wining films (1984 The Times of Harvey Milk and 2009 Milk), operas, books including children’s books, plays, music, awards, proclamations and starting in 2010, an annual official governmental day of recognition. Harvey showed us all what one person, standing up loudly and clearly, against a fierce societal fear and prejudice can accomplish. He created a rich and vivid message of hope and an enduring dream, teaching us how to create our own and leaving them for us to realize. The Harvey Milk Foundation was established by Harvey’s nephew Stuart Milk and Harvey’s campaign manager Anne Kronenberg. Stuart, like Harvey has chosen to speak out as an openly gay advocate for not only the LGBT community but the collective communities of people who remain marginalized or diminished by inequality in the law as well as societal inequality. Although Stuart was just 17 years old when his uncle was assassinated in public office, he has continued to spread around the globe the conversations, stories and messages that Harvey shared with him. Our co founder, Anne Kronenberg was Harvey’s campaign manager for his successful bid for public office in the late 70’s, was Harvey’s senior staff person in San Francisco City hall and friend during the five years that Harvey lived in San Francisco. In discussions held with the Milk family and Harvey’s friends, the concept of the Milk Foundation gave rise and with the vision of this group of Harvey Milk intimates the Foundation was born. Harvey believed broad public education and dialogue was paramount to his life’s work as a civil rights leader and, as if riding on Harvey’s shoulders, the Milk Foundation seeks to inspire individuals, communities and organizations to carry on his values in a timeless vision for a better world. From targeted programs that support cross cultural discussions, working to harmonize and share best advocacy practices on a global level, to Harvey’s very unique but critical focus on building a foundation for societal change through face to face conversation with communities that have traditionally opposed LGBT equality, the foundation works to realize a dream that Harvey began and that is up to all of us to create. Stuart Milk and Foundation volunteers have worked diligently to bring forward the story of his uncle, successfully collaborating with Milk day legislation sponsors Senator Leno and the California Statewide Equality Organization to have every May 22 permanently celebrated as Harvey Milk Recognition Day throughout California. In giving Stuart the 2009 Equality Champion Award, EQCA said, “no one represents the legacy of Harvey Milk better then his nephew who worked tirelessly to personally get the support needed from Ambassadors, Senators, Democrats and Republicans- resulting in having the annual Milk Day bill being signed into law”. Stuart Milk along with Anne Kronenberg, have traveled to nearly every corner of the world spreading Harvey’s struggle for justice, equality, and civil rights. The vital work of the Foundation Harvey inspired, like his life story, is resonating stronger each day around the globe, bringing us that much closer to the dream of full un-qualified equality. Harvey often spoke of the need for a community to pass on at the global level its own stories of strength, authenticity, value, and accomplishment. The Foundation puts particular emphasis in supporting both conventional and new forums and media for Harvey’s story and the LGBT community’s collective story to be told across broad and culturally diverse audiences. The Foundation has taken the lead on establishing a set of online and new media materials for International Harvey Milk Day activities across the globe and we have increasingly offering on the ground support where possible with legacy building events and monuments that have a educational and societal ‘learning’ element that furthers inclusion and acceptance. 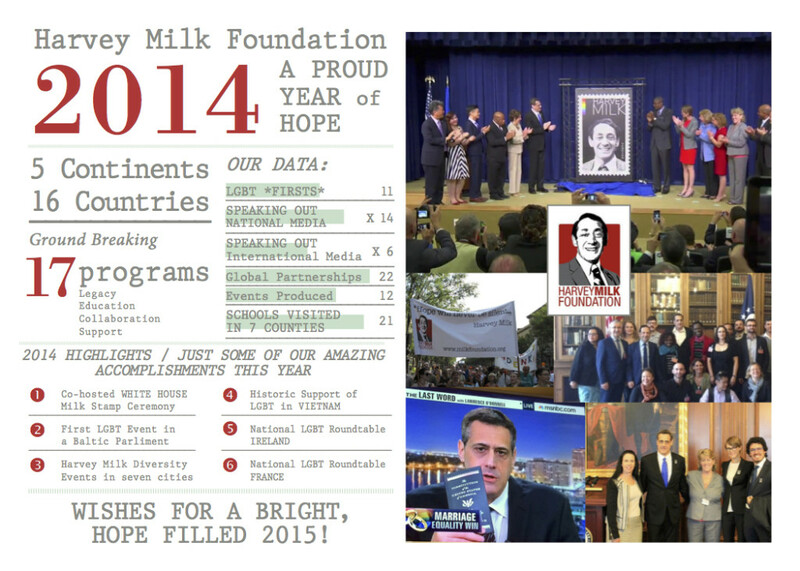 From Stuart Milk’s successful early work in 2008 and 2009 with EQCA and Senator Mark Leno on establishing an annual Harvey Milk Day holiday for the nearly 40 million California citizens, to the roll out of Harvey Milk Day educational material and supports, the Milk Foundation has a core mission element to see every May 22 celebrated in as many communities as possible, thus providing support to local programs and equality initiatives. Working with the CA Museum in Sacramento, Milk Foundation leadership worked to provide a year long educational and interactive exhibit geared to adults and school children that covers Harvey’s full life from Childhood and College activist in the late 1940’s to avant-garde theatre producer in the late 60’s and early 70’s to his election in San Francisco and the aftermath of his assassination. The very first educational partnership of the Foundation was with the play, “Dear Harvey – Stories of Harvey Milk” written by Patty Loughery and commissioned by the Diversionary Theatre, the Foundation and play write have partnered to provide the play to schools, universities, and community organizations throughout the US. Work is in progress to have the play translated into Spanish and Italian and the play has been performed at the Kennedy Center in Washington, DC as well as New York City’s Fringe Festival. Beginning in 2009, the Foundation leadership has been working to build effective collaborative partnerships in order to enable the LGBT youth organizations to access Regional or Federal funding in the US and in the EU in Europe. Because Harvey had a very special desire to empower local communities and connect LGBT people with other marginalized populations, the foundation has set a goal to provide support to education, business and youth projects on a national and international level. Our collaborative efforts include past and ongoing partnerships with 17-24-30, the United Nations Association, the CA State Department of Education, the International Court System, Metropolitan Business Association, Equality Italia, the Roma Gay Center, Madrid Muestra T, Equality California, CESCal and SFGMC. These partnerships have successfully produced and presented annual programs and conferences for the public, for educators, for policy and business leaders on the intersection of business and human rights, for youth outreach and support, and for strengthening diversity within societal and cultural environments as well as creating systemic change that supports full LGBT and minority inclusion. The Foundation provided Speakers and capacity building program offerings are one of the most effective and popular methods of public education and collaborative practices based on the legacy of Harvey Milk with its ability to support local, regional and national human rights efforts. Stuart Milk and Anne Kronenberg have supplied Presidents, Governors, Ambassadors, schools, universities, businesses, government entities, labor unions, community-based groups, and other organizations with a personal link to Harvey the man and the leader, while lending contemporary meaning to his core beliefs and values. Stuart Milk has spoken at events in Europe, Asia, Latin America, the Pacific, and throughout North America in venues with hundreds of thousands to more intimate gatherings at the White House, to foreign parliaments and capacity building events in individual backyard gatherings. Anne Kronenberg has spoken at events in Europe and throughout North America. Both Anne and Stuart have offered an inspired message on the legacy and life of Harvey Milk and continue to provide audiences with that essential life affirming ingredient, “Hope, Hope for a better Tomorrow”.